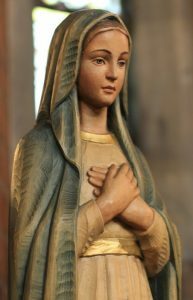 The Parish of S. Mary the Virgin was established in 1884 as a Mission District within the ancient parish of Tottenham. The impetus for the foundation came from Bishop William Walsham How who, as Bishop for East London (with the title of Bishop of Bedford), was attempting to provide churches and clergy for the vast new populations moving into the area. Walsham How’s East London Churches Fund provided some of the support but the parish was set up as the Marlborough College Mission. 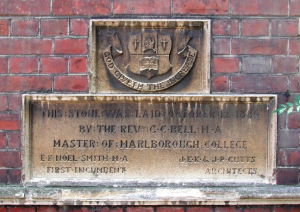 The boys and Masters of the Wiltshire public school undertook to fund, from their chapel collections for five years, a stipend for a Missioner of £150 per annum. In fact donations were much more generous than this and old boys contributed significantly to the costs of building the church and other Misison buildings. The Mission Priest appointed was E. F. Noel Smith. 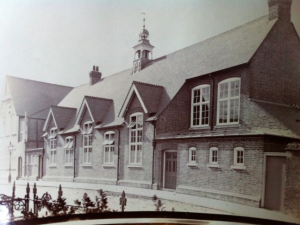 He began by hiring the newly-built board school in Coleraine Park (today Coleraine Park Primary School) for services. The work took off and Smith, joined by two curates and large numbers of lay workers, built a church and hall, a vicarage and a Church Lads’ Brigade drill hall over the following ten years. 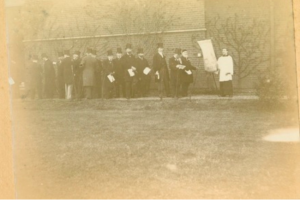 He also established a Mission Church and Sunday School Hall which were enlarged and finished after Smith died of appendicitis while in office in 1908. Two relatively short incumbencies during and after the Second World War (J.G. 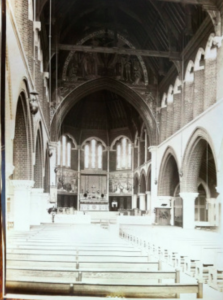 Jeffreys 1940 – 1945; W. Howes Morris 1946 – 1951) had to deal with the damage (the church suffered a near-miss from a flying bomb) and the fact that the parochial halls and mission church were requisitioned for war use. Although there were grants for their repair after the war, they have not been used again for the Sunday schools, and services at the Mission Church ceased. The Kemble Hall as built. You can see the front gate of a house. These houses were demolished when the park was built. 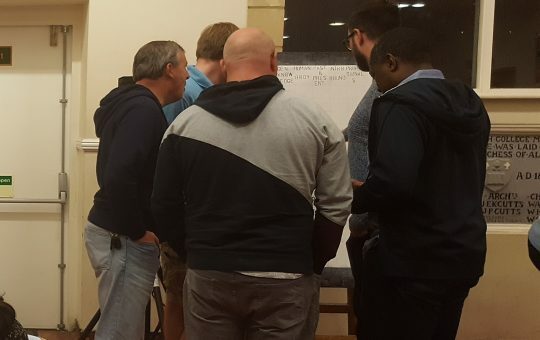 future of the parish but the appointment of a new Bishop to the Episcopal Area of Edmonton gave a reprieve and a new appointment was made. Fr. 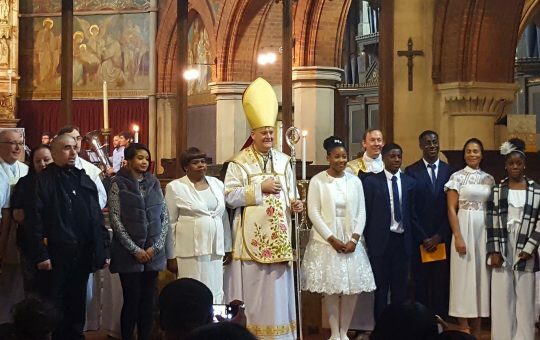 Christopher Tuckwell had experience as a parish priest in the West Indies and was able to build on work Evans had already been doing to welcome members of the West Indian community which, by now, was firmly established in the area. He introduced a Nave Altar and his pastoral gifts bore fruit in renewed growth. It was he who, in preparation for the Centenary celebrations, renewed the link with Marlborough. The parish was once again given staff and, when Tuckwell resigned in 1994, he was succeeded by his curate, Fr. Luke Miller. Fr Tuckwell is now administrator of Westminster Cathedral. 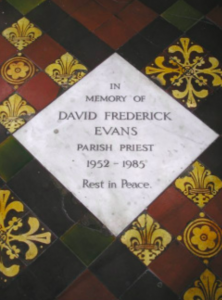 Memorial to Fr Evans in the chancel of S. Mary’s. Kemble Hall in 2004; the reopening of the Mitchley Road Halls for worship and community use in 2010; and the restoration of the Hill Organ in S. Mary’s in 2010. Fr Miller left to become Archdeacon of Hampstead in January 2011. His curate, Fr Morris, became the new Vicar in September 2011. While we do not (yet) see 900 Easter Communicants, at Easter 2010 we had more communicants than at any time since 1937 – a trend continued in 2011 and 2012. 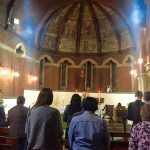 The parish looks forward with confidence and hope to the future as we continue to seek new ways of bringing the Good news of Jesus Christ to the people of Tottenham. Based on the writings of Fr Miller.